The Advanced Jazz Guitar Harmony series begins where the Jazz Guitar Harmony series left off. Unlike the first series, which consisted of parts 1-5, and was designed primarily to be worked with in sequential order, each class in the Advanced Jazz Guitar Harmony series is complete unto itself and explores one specific subject in depth. 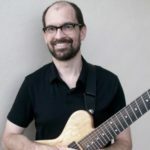 Classes in this series are intended for the intermediate to advanced jazz guitarist who has either completed the five classes of the Jazz Guitar Harmony series or who already has a working command of the basics of typical jazz guitar harmonic vocabulary. In this class, two specific types of chord voicings, drop 2&4 and drop 2&3 will be examined in detail. The term “voicing” refers to how the notes are arranged in a chord. Many of the typical stock jazz guitar chords are shell voicings, close voicings, drop 2, and drop 3, all of which are explored in clear, systematic detail in the Jazz Guitar Harmony series. Drop 2&4 and drop 2&3 are two other possible chord voicings which are a little more off the beaten track for most jazz guitarists. 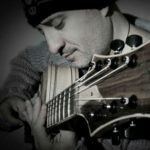 These voicings have a unique and intriguing sound due to their relatively large spans and, in some cases, unusual intervallic combinations, and yet most of them are just as playable and practical for every day use as the more mainstream types. Until recently, few, if any, of these voicings were in common use among jazz guitarists. Even though the latest generation of modern jazz guitar masters in the early 21st century have begun to make use of them more often, both the drop 2&4 and the drop 2&3 voicings remain less utilized than other voicing types. This means that these voicings contain a wealth of new, unexplored possibilities for guitarists looking for fresh sounds to add to their harmonic vocabulary. An excellent and thoughtful class on the "other" drop chords. I have been using voicing from this class in my own playing for a few months now and they have really expanded my voicing library. Highly recommended! I have written a fair number of reviews here, only because I have seldom been disappointed in Mike’s Classes, and never once by Tom Lippincott’s. I was reluctant to get this one as it seemed like a somewhat limited topic. I’m glad I got it and you will be too. Though focused, it is not about subbing the Mixodorkian 47th for the Flatulent 8th, but creating voicings for chords you already know is a way I have not seen elsewhere. Much is said about close, "piano" voicings, but not much about this idea. His audio and video is also improved, and his teaching ways are great. If you want to get into the ways that the "modern", "cutting-edge" players are doing things, this class, though not a wide-ranging subject, is pointing right that way. I’m glad I have this class. Very glad.